Home » Native American Artists » Kee Yazzie, Jr.
Kee Yazzie was born in 1969, went to school in Ganado, Arizona, and attended college in Utah, where he studied architectural and drafting design. He speaks multiple languages, including Laotian, Thai, and Khmer. 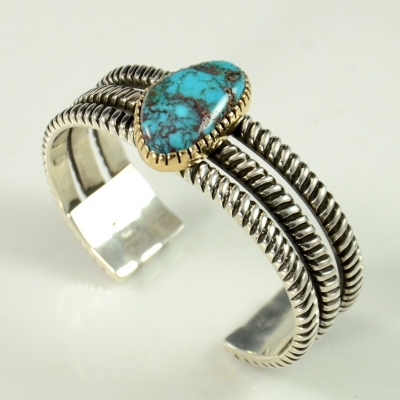 Kee Yazzie is a self-taught artist and began to make jewelry in 1995. 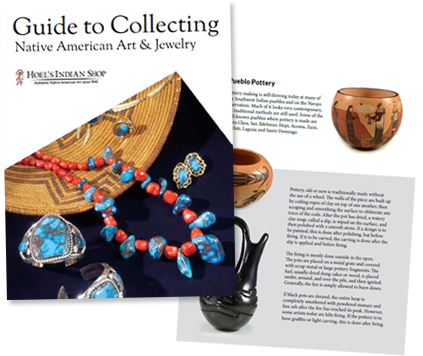 “He learned jewelry-making techniques by trial and error and experimentation, teaching himself some basics such as soldering and working with gold,” notes Diana Pardue in Contemporary Southwestern Jewelry. 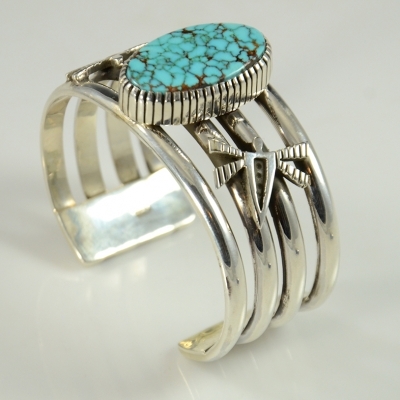 He also learned techniques from silversmith Ray Scott, and other techniques in workshops at Duane Maktima’s Pueblo Five Design Institute. 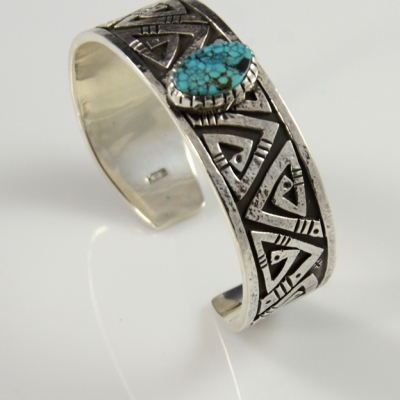 “Some of his designs are inspired by petroglyphs from Jeddito near Keams Canyon, Arizona,” notes Pardue. This inspiration makes his work utterly unique. 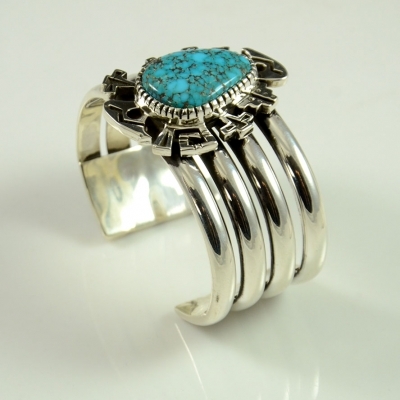 Today, Kee is an accomplished overlay artist and has won awards from Eight Northern Pueblo, the Navajo Market at the Museum of Northern Arizona, the Heard Museum, and elsewhere. 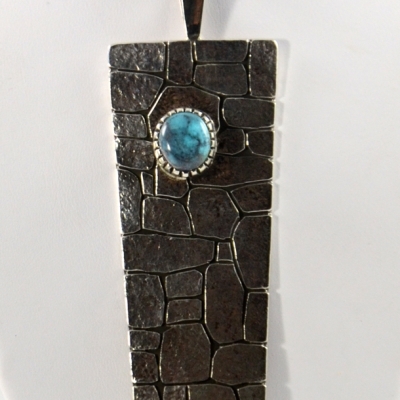 His work has been shown by the American Museum of Natural History and the Museum of Arts and Design. Pieces by Kee Yazzie, Jr.
Beautiful Sterling Silver Navajo Ring with a Lovely Coral by Kee Yazzie, Jr.
Sterling Silver Navajo Pendant with Candelaria Turquoise by Kee Yazzie, Jr.
Navajo Sterling Silver Overlay Bracelet with Lone Mountain Turquoise by Kee Yazzie Jr.
Silver Bracelet with Natural Nevada Blue turquoise by Navajo Artist Kee Yazzie Jr.